In a large saucepan over medium heat add the olive oil and bring to a heat. Add the onions and salt and cook for 5 to 6 minutes, until translucent. Increase the heat to medium high and add the rice. Toast the rice (let it stick slightly to the bottom of the pan, then scrape it off and repeat). Add the wine to the pan, season with salt to taste and stir well. Cook over a medium heat stirring continuously until the wine has been absorbed by the rice. Add the saffron to the hot chicken stock and stir well until the the stock should turns to bright yellow. Start adding the chicken and saffron stock into the rice, a cup at a time. Cook and stir continuously until the stock is absorbed, then repeat two more times. Taste a bit of the rice to make sure it is cooked al-dente. If the rice is not cooked yet, add some more chicken stock and continue cooking until absorbed. 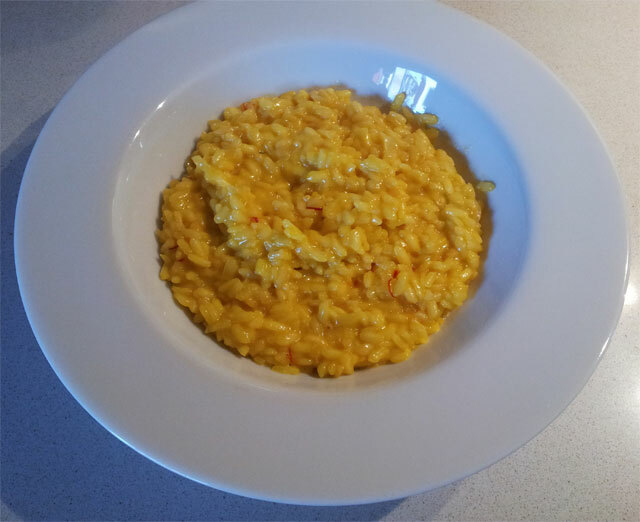 When the rice is ready, remove from heat, add the butter and Parmesan cheese and stir well until the butter is melted and the risotto is smooth and creamy.